Now that April is well under way, and the Walleye spawn seems to be winding down, Nebraska anglers will be shifting their attention to early Crappie season. As water temps begin to warm, hordes of these tasty pan fish will begin to move into the shallows, following creek channels, all kinds of cover along shore lines, and possibly featureless flats to find forage. That is what early season Crappie migration is all about, -- feeding not spawning. A majority of Crappie will be caught in areas where little or no spawning occurs. 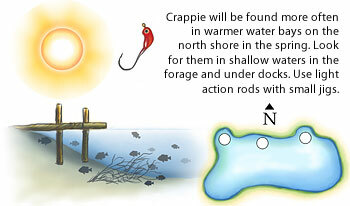 These spots harbor, insects, or have other types of forage that attract crappie. If you're fishing a natural body of water, the prime spots are shallow bays with soft dark bottoms, on the north side of the lake. The soft dark bottoms will absorb heat from the spring sun, and the north shoreline gets the maximum amount of sunlight during the day. Look for bays that are connected to the main body of water by narrow openings, or short channels that keep the colder lake water from moving into the bay. How long crappie remain in these bays depends upon depth, cover, and structure. Shallow bays that have a maximum depth of 3 to 4 feet may get red hot early for a week or two, then the fish move out. Bays with a depth of 8 to 15 feet will hold crappie much longer. Shallow bays are usually fished best from the bank, even if a boat is used to get there. Crappie are often in 1½ to 4 foot depths, and bank fisherman can easily sneak up to a spot and quietly pluck out the fish. Any cover in a bay that’s in at least 18 inches of water or more can hold crappie. Look for stumps, brush piles, fallen trees, flooded shoreline cover, docks, and old weeds. Even debris piled up in a corner can draw fish. Any kind of structure can hold crappie especially if the water is off colored which it usually is in these kinds of bays. Very often the shoreline with the quickest taper will be the best, and a slight cover free ledge that may only drop a foot or two and run a short distance may hold the bulk of the fish. Try tossing tiny jigs, and look for deeper water and ledges. A 6-foot light action spinning rod and a reel spooled with 4 lb. Test monofilament is ideal. A small fixed float can be used along the edges or in open water, while a pear shaped slip float will work in tighter cover situations or in deeper water. It’s critical that a long soft tipped rod is used, particularly since the jig or minnow is often dabbled into spots without a float. You don’t want the crappie to feel the resistance from a stiffer rod, so it has to have the flex so the fish doesn't drop the bait. Other spots that can be hot for crappie are man-made channels and culverts. Compared to natural lakes, the crappie fisherman needs to look for the same things. Sheltered areas away from moving water. Places that receive direct sunlight, and warm up faster than deeper water. Places that are 4 to 5 feet deep will be better than 2 to 3 feet deep (18 inches or deeper if the water is cloudy). Shorelines that tend to have a lip are really good. The back end of T-shaped, or L shaped channels that are protected by wind and current. Cast parallel to the shore line, walk and troll the bank and dabble your presentation around cover. Boat docks are great for crappie. The lower the dock is to the water level the better because they create better shade. During cold days crappie will often move out of the channel and suspend at its mouth if some deeper water exists. Swim a jig through various depth levels and/or try a minnow at different levels below a float. Culverts are sometimes used to drain marshes or back water areas into larger bodies of water. Don’t overlook these. They are easy to fish and can be very productive. Crappie will hold in and around the current flow. Try using the old fashioned nickel sized red and white bobber, and experiment fishing at different depths. The current will move your presentation from the faster water into the staging area where the fish will be waiting for an easy snack. You should also try a lightweight soft-plastic jig. Fish it at several levels and different angles to the current.